Our pasta boilers are built for flexibility. They can be used for anything from boiling an egg, heating sauce pouches, for the sous vide cooking of vacuum packed items, and even pre-packed portions of frozen rice. The controlled boiling abilities of each pasta cooker ensures that pasta is perfect time after time, and is suitable for all types of pasta — regardless of the pasta shape and if it's fresh/dried. The versatility of the pasta boilers means that they can be used in a variety of cases, whether that's as steamers, or even as a bain marie. This helps you to not only save valuable space, but reduces the need to buy additional equipment. There are a range of basket sizes available for all models, enabling you to cook individual portions on demand, as your needs see fit. Our electric models also all feature boil dry protection, ensuring that no damage is caused when the water is completely evaporated. 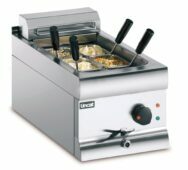 The Lynx 400, Silverlink 600 and Opus 800 units have been built with high quality grade 304 stainless steel with corrosion resistant elements (starch, water and salt are harsh on stainless steel and elements thus why we use a higher grade of stainless steel compared to other units), FriFri uses grade 316 stainless steel — ensuring enhanced durability and reliability throughout each units lifespan. Ensure that pasta is perfect time after time. This pasta cooker has been designed and built to ensure a longer life in the harshest conditions by using grade 316 stainless steel. Produce pasta that's perfect every single time with a counter top pasta cooker from the Lynx 400 and Silverlink 600 series.